Gray Acer Aspire V5-561P-6869 is a classy looking yet budget priced touchscreen laptop with a high performance and power efficient 4th generation i5 processor, high definition Dolby Audio, DVD drive and a good range of useful connectivity ports for everyday computing, although not with any significant wow factor, but at a price that won't break the bank. Acer Aspire V5 has a Haswell Intel Core i5-4200U processor at 1.60 GHz speed that can go up to 2.6 GHz with turbo boost function, 4GB RAM and 500GB hard drive at 5400 rpm both of which at standard sizes but more than enough (you can add additional 4GB RAM and Solid State Drive by simply removing a single screw) for decent amount of multitasking and the ability to store most of your music, videos and files (4GB and 500GB are satisfactory for regular computer users) and the 64-bit Windows 8.1 operating system with its new user friendly features that make it even a more preferred OS than Windows 7 by many. Thinner and fairly bright 15.6 inch diagonal LED backlit and energy efficient 16:9 cinematic aspect ratio 10-finger multi-touch wide screen with 1366 x 768 pixel resolution and integrated Intel HD Graphics 4400 with 64MB system memory offers decent image quality for still photos and videos and you'll experience reasonable but not outstanding high definition sound quality with Dolby Advanced Audio v2 software, so you may want to still get a pair of speakers or use your headset. 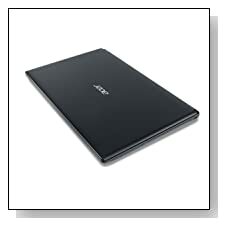 Plastic exterior and plain but modern looking with half glossy finish gray Acer Aspire V5 weighs around 5.6 pounds so not that light but portable enough. It has a full chiclet style keyboard with narrow but OK to use 10-key numeric keypad and its battery should give you around 4 hours of battery life in average use that will decrease over time like any laptop battery. In terms of connectivity, it has almost everything you'd expect from a budget to medium level computer: A tray loading DVD±RW/DVD-RAM/DVD±R Dual Layer, 1 USB 3.0 port, 2 USB 2.0 ports (one of which is a sleep and charge), 802.11a/b/g/n, Bluetooth 4.0, 10/100/1000 Gigabit Ethernet, an HDMI port to connect to your big display HDTV, a 15-pin D-sub VGA port to external monitors, an integrated Memory Card Reader for transferring photos from your camera, high definition webcam with built-in microphone (supports 1280 x 720 resolutions). 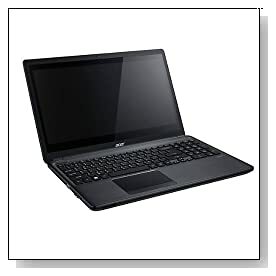 Conclusion: The Acer Aspire V5-561P-6869 is a decent laptop that will let you do everyday things like web browsing, video viewing and word processing smoothly and efficiently. It comes with an energy efficient Haswell i5 processor and a thin LED backlit screen to help you save on energy bills but an average size 4GB memory and 500GB hard drive which you'd expect at this price level. Windows 8 may take a little time to get used to but is also nice to use with a touchscreen laptop. This Acer doesn't have a lot to offer in the looks department but surely doesn't compromise the power and performance despite the low price tag.